« Send this cartoon to anyone who writes or reports on a badaptationist story. In the paper, Gould and Lewontin (1979) drew an analogy between the “spandrels” (or, if you’re overly pedantic about architectural terminology, “pendentives“) in Saint Mark’s Basilica in Venice and features of organisms that are often assumed to represent adaptations whose current functions reflect the reason for their origin. The spandrels in St. Mark’s Basilica house elaborate mosaics depicting important Christian iconography, and represent one of the most stunning aspects of the cathedral. However, housing religious imagery is not why the spandrels were created in the first place. As Gould and Lewontin (1979) point out, spandrels are the inevitable result of resting a domed ceiling atop walls with arched doorways. Once they exist, spandrels can be co-opted for a function such as artistic decoration — but whatever this current function may be, it does not, by itself, explain the origin of the structures. Many traits of organisms, rather than being the result of adaptive evolution under selection for their current function (if any) are, in fact, biological “spandrels”. 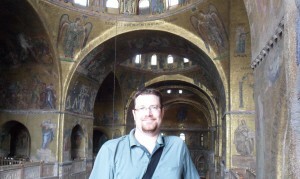 Yours truly enjoying the amazing artistry in St. Mark’s Basilica. The tendency to conflate current function with historical origin is one of the things that Gould and Lewontin saw as a pervasive problem in the evolutionary biology of the 1970s. They also considered the general tendency to focus almost exclusively on adaptationist explanations for individual traits to be misguided. Not only did authors not properly consider alternative, non-adaptive explanations, they presented only weak evidence in support of adaptive “just-so stories” or simply moved on to a new adaptive tale if evidence was found lacking for a particular explanation. An adaptationist programme has dominated evolutionary thought in England and the United States during the past 40 years. It is based on faith in the power of natural selection as an optimizing agent. It proceeds by breaking an organism into unitary ‘traits’ and proposing an adaptive story for each considered separately. Trade-offs among competing selective demands exert the only brake upon perfection; non-optimality is thereby rendered as a result of adaptation as well. We criticize this approach and attempt to reassert a competing notion (long popular in continental Europe) that organisms must be analysed as integrated wholes, with Bauplane so constrained by phyletic heritage, pathways of development and general architecture that the constraints themselves become more interesting and more important in delimiting pathways of change than the selective force that may mediate change when it occurs. We fault the adaptationist programme for its failure to distinguish current utility from reasons for origin (male tyrannosaurs may have used their diminutive front legs to titillate female partners, but this will not explain why they got so small); for its unwillingness to consider alternatives to adaptive stories; for its reliance upon plausibility alone as a criterion for accepting speculative tales; and for its failure to consider adequately such competing themes as random fixation of alleles, production of non-adaptive structures by developmental correlation with selected features (allometry, pleiotropy, material compensation, mechanically forced correlation), the separability of adaptation and selection, multiple adaptive peaks, and current utility as an epiphenomenon of non-adaptive structures. 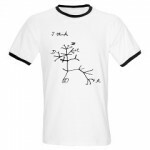 We support Darwin’s own pluralistic approach to identifying the agents of evolutionary change. Some subsequent authors have charged that Gould and Lewontin (1979) presented a straw man, and did not provide a fair assessment of what members of the so-called adaptationist camp actually did or said. Nevertheless, I think many biologists feel that theirs was a very important contribution, at least as a warning for how the study of trait evolution could go awry. I would take a stronger position, and argue that not only was the Gould and Lewontin (1979) paper needed at the time, but that it is still needed today. And nowhere is this more true than in studies of human behaviour and anatomy, particularly because these tend to be widely covered in the science media. Evolutionary psychology takes a large amount of flak from evolutionary biologists and others for its perceived tendency to present “just-so stories” or to make extraordinary assumptions about the social and physical habitats of hominin ancestors. But this is not limited to studies of human minds by any means. I recently discussed one example, the widely-reported claim that the dimensions of human hands evolved in large part to allow the formation of fists. In that post, I outlined several major problems with the underlying assumptions and the (very weak) data that were presented as supporting evidence. I won’t re-hash these points here, but many of them apply equally to the even more recent claim that a human trait is the product of adaptive evolution: namely that the wrinkling of our fingers and toes when submerged in water is an adaptation for gripping in wet conditions. The idea was first put forward by Mark Changizi and colleagues of 2AI Labs in Boise, Idaho. Changizi has a PhD in applied math and primarily studies neurobiology, but in this case his focus was on why fingers wrinkle when they’re soaked. Specifically, Changizi et al. (2011) wondered whether the wrinkled patterns that form on the fingers after prolonged soaking have a function similar to the treads on tires, namely for channelling water and improving grip in wet conditions. 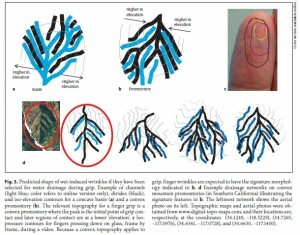 Based on the idea that wrinkled digits might actually represent water channels, they looked at photos of 28 wrinkly fingers from 13 hands that they found online. They then compared these wrinkle patterns to the channels of rivers in a mountainous drainage system and to the treads on car tires and found that they are similar in that they branch and diverge from the middle of the finger. From Changizi et al. (2011). In addition, the authors noted that the wrinkling of fingers is not simply a result of osmotic changes when hands are soaked, and that there is evidence that the process is linked to the action of the autonomic nervous system. Or, at least, wrinkling does not occur if there is nerve damage in the hand. In fact, physicians use wrinkling in water as a test of neural function in the limbs (Wilder-Smith 2004; Barneveld et al. 2010). So, the evidence to this point was a) wrinkling seems to be under nervous control, and b) the wrinkles look like drainage systems or tire treads. This hypothesis has gained more attention recently with the publication of a follow up study by Kareklas et al. (2013) in the lab of Tom Smulders in the Institute of Neuroscience at Newcastle University. Kareklas et al. (2013) wanted to test the idea that wrinkling improves grip in wet conditions. To do so, they had 20 volunteers soak their hands in 40°C water for 30 minutes and then had them move marbles of different sizes from one container to another, with the source container either filled with water or dry. They compared this to the performance of the volunteers in the same task when their hands had not been soaked and therefore their fingers were not wrinkled. From Kareklas et al. (2013). It took participants anywhere between 72 s (fastest person) and 198 s (slowest person) to transfer all the items. All participants transferred dry objects more quickly than submerged objects, taking on average 17 per cent (±2.3% s.e.m.) more time to transfer submerged objects (F1,16 = 35.80, p < 0.001). With wrinkled fingers, transfer of submerged objects happened in 12 per cent (±2.3% s.e.m.) less time than with unwrinkled fingers. 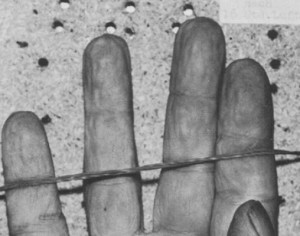 There was no difference in the time it took to transfer dry objects with or without wrinkles on the fingers (interaction: F1,16 = 44.10, p < 0.001; figure 1). This finding shows a clear advantage of having wrinkled fingers when manipulating submerged objects, but not dry objects. In short, soaking your hands in 40°C water for 30 minutes will give you a 12% advantage in picking up round, smooth objects if they are underwater. Not surprisingly, given that it is about a familiar yet curious human trait, the science media have reported this study widely. Now, as you may have guessed, I don’t find this hypothesis compelling at all, for many reasons. The first is that it is based on the thinnest of datasets. Photos of 13 hands with finger wrinkles that resemble drainage channels. And a small advantage in manipulating wet marbles. That’s it for the data. I also don’t buy the conceptual arguments, for example Changizi’s claim that there are infinitely many possible patterns for wrinkles to form, and yet we see the one that is consistent with rain treads. I strongly doubt that there are more than a few possible arrangements for wrinkles, given the properties of human skin and the shape of human digits. Moreover, it looks to me like there is substantial variability in wrinkle patterns even within the tiny sample of their study. Would all of these channel water effectively? We don’t know, because no effort was taken to demonstrate that wrinkles actually displace water. (I have my doubts about this. Treads are hard, fingers are soft. Tires rotate, fingers don’t). Finally, I am not convinced that the link to the central nervous system implies that this trait is functional. Vasoconstriction is involved (Wilder-Smith and Chow 2003a,b), and this can be controlled by the nervous system, but that alone does not mean that the trait evolved as an adaptation rather than as a spandrel. Perhaps the effect is simply a byproduct of other nerve signal changes that are functional in response to hot water immersion. I don’t know, but neither does anyone else because such non-adaptive hypotheses have not been considered. There certainly seems to be some cross-wiring going on, since reduced wrinkling ability is correlated with congestive heart failure (Kamran et al. 2011) and heart rate variability (Win et al. 2010). The photo above shows a pretty typical wrinkle pattern for a hand that has been submerged in water (in this case, for 120 minutes in 13°C water). What sets this hand apart from the ones examined by Changizi et al. (2011) is that it belongs to a dead person. That is to say, wrinkling occurs, with the same pattern and at a similar rate, even when the subject is deceased (Weber and Laufkötter 1984; Reh 1984). Studies were carried out systematically in both corpses and the hands of corpses in order to find out when ” washerwoman ‘s skin” begins. The temperatures ranged between 10 degrees and 18 degrees C and the time of the experiments did not exceed 300 min. The initial formation of washerwoman ‘s skin could be observed after 20-30 min at the fingertips and after 50-60 min in the entire finger. The longest intervals observed were 100 or 150 min, respectively. These long intervals were interpreted as being exceptions from the norm, probably due to either extraordinarily heavy strips of fat on the fingers or abnormally hard skin on the hands. The course of washerwoman ‘s skin obviously depends on the water temperature, and afterwards it disappears rather slowly–even after a short immersion–in the open air. We will carry out additional experiments in the future. Why is the response strongest in very warm water (Cales et al. 1997)? Is 40°C water really encountered a lot under natural conditions of foraging or running? If this is an adaptation for simply channelling water, why is the response strongly affected by the salinity and pH of the water (Tsai and Kirkham 2005)? I don’t think these observations provide support for the idea that finger wrinkling is an adaptive response to being wet, or at least they are not what I would expect to be the case if this were such an adaptation. In any case, the bigger problem with the wrinkled gripper ape hypothesis, the punching ape hypothesis, and other such hypotheses is that they are not based on solid evolutionary thinking. More specifically, the authors of these hypotheses do not seem to work through the assumptions that would have to be true for these traits to be adaptive in the way that they propose. Did an ancestral population actually have variation in this trait, and is it heritable? Did these ancestors really submerge their hands and feet regularly? Did individuals with more wrinkles actually have more children than individuals with less tread-like wrinkles? Many biologists favour the adaptationist approach to studying trait evolution. That is, they begin with ideas about why a certain trait might be adaptive and then proceed from there. Others (increasingly, myself included) may argue that there must be evidence that the trait is adaptive in the first place before such hypotheses are pursued. This may be a matter of preference or training or philosophical bent more than anything. However, it should be clear either way that there are good and bad ways to test adaptationist hypotheses. Notice a trait and think up an adaptive function for it. Assemble a small number of modern humans and get them to do whatever it is you think the trait is functional for (say, punching a heavy bag or picking up wet marbles). Make this unrealistic in terms of ancestral environments (e.g., use trained martial artists for punching or soak in 40°C water and handle glass marbles) and don’t control for other factors (say, warming up the hand). Compare this as a binary trait rather than considering variation. For example, a buttressed fist vs. an open palm or fully wrinkled fingers vs. dry fingers. Find a very weak effect, even with this extreme comparison. Conclude that the trait in question evolved for the hypothesized function and ignore the obvious assumptions that are required for such a conclusion to hold. Notice a trait and determine the extent to which it varies within the study species. Explicitly address the necessary assumptions about ancestral traits, habitat, selective coefficients, and population size. Use the comparative method within a phylogenetic context. Identify other species that have the trait and those that lack it. 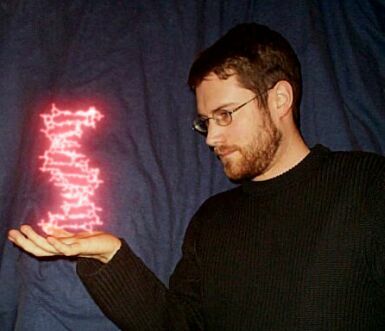 Has the trait evolved independently under similar conditions? Is it found in species that would not be expected to exhibit it if it evolves adaptively for a particular function? Consider and rule out non-adaptive explanations (developmental constraints, pleiotropy, etc.) as much as possible. Getting the data for this second list is much more difficult than for the first, but without them any conclusions about adaptive evolutionary history remain subject to the criticisms laid out several decades ago by Gould and Lewontin (1979). Cales, L., R.A. Weber, and T.X. Temple (1997). Effects of water temperature on skin wrinkling. J. Hand Surg. 22A: 747-749. Changizi, M., R. Weber, R. Kotecha, and J. Palazzo (2011). Are wet-induced wrinkled fingers primate rain treads? Brain Behav. Evol. 77: 286-290. Gould, S.J. and R.C. Lewontin (1979). The Spandrels of San Marco and the Panglossian Paradigm: A Critique of the Adaptationist Programme. Proc. R. Soc. Lond. B 205: 581-598. Kamran, H., L. Salciccioli, and J.M. Lazar (2011). Reduced water induced skin wrinkling in congestive heart failure. Clin. Auton. Res. 21: 361-362. Kareklas, K., D. Nettle, and T.V. Smulders (2013). Water-induced finger wrinkles improve handling of wet objects. Biol. Lett., in press. Reh, H. (1984). On the early postmortal course of “washerwoman’s skin” at the fingertips [in German]. Z. Rechtsmed. 92: 183-188. Tsai, N. and S. Kirkham (2005). Fingertip skin wrinkling — the effect of varying tonicity. J. Hand Surg. 30B: 273-275. Van Barneveld, S., J. van der Palen, and M.J.A.M. van Putten (2010). Evaluation of the finger wrinkling test: a pilot study. Clin. Auton. Res. 20: 249-253. Weber, W. and R. Laufkötter (1984). Stage classification of washerwoman’s hands at experimental time intervals [in German]. Z. Rechtsmed. 92: 277-290. Wilder-Smith, E.P.V. and A. Chow (2003a). Water-immersion wrinkling is due to vasoconstriction. Muscle Nerve 27: 307-311. Wilder-Smith, E. and A. Chow (2003b). Water immersion and EMLA cause similar digit skin wrinkling and vasoconstriction. Microvascular Res. 66: 68-72. Wilder-Smith, E.P.V. (2004). Water immersion wrinkling: Physiology and use as an indicator of sympathetic function. Clin. Auton. Res. 14: 125-131. Win, S., L. Salciccioli, H. Kamran, P. Baweja, M. Stewart, and J.M. Lazar (2010). Water immersion-induced skin wrinkling is related to heart rate variability. Cardiology 116: 247-250. A newer study does not support the original gripping results. 16 comments to The great wrinkled finger debate. I think an adaptive advantage is possible, but I don’t like the marble test very much. We should think in longer evolutionary timespans. What about improving grip when climbing in wet trees? Do monkeys have this trait too? Climbing wet trees is possible, sure. But we have zero data to show that wrinkled fingers actually improve climbing or gripping on rough surfaces. Also, I think the fact that wrinkling takes so long (several minutes, even when submerged in hot water) would be a problem for this hypothesis. What a great post! From a developmental biology perspective, too, the hypothesis doesn’t make a lot of sense. I was originally tuned into this assertion by a scientist friend, who prompthy took my skepticism into account and then found your takedown. I actually hadn’t known about the original papers, and didn’t find them on first perusal. Here’s my hand-waving hypothesis. Dermatoglyphs form thanks to mobilization of a similar genetic program that enabled the thicker skin on the foot pads of other mammals. (I don’t know if you immerge the feet of a dog in warm water for a while, if the pads will wrinkle…) So, let’s assume that like the jaw, the appendix, the earlobe and so many other anatomical features, we’re part of an evolutionary continuum and co-option of genetic programs to make certain features whose utility we don’t question in other animals, leads to an analogous structure in humans. Then, autonomous nervous control of wrinkling may be a response to the osmotic change in the skin – but if it happens in recently dead people, nervous control of this is still possible, because the cells are still alive (think growing fingernails) for some time, even if the brain is dead. What I wonder is, if it were possible to introduce similar osmotic changes in the skin of other parts of the body, perhaps there is some sort of contractile response there. Perhaps the rete ridges of the finger and toe pads are more permeable, even if they are harder? When they are too keratin-laden (horny) then the contractile action of wrinkling wouldn’t be so visible. Look at all the off-the-cuff – but testable – hypotheses it’s possible to generate! Anyhow, thank you for taking down yet another example of “I thought of a hypothesis, it seems to make sense, and look – someone tested one similar to it with weakly supportive results – so it must be true!” Talk about confirmation bias. I like the wet tree hypothesis a bit more, and there are plenty of zoos with captive tree-climbers where the idea could be tested. Having opposable thumbs has a downside: that’s one less digit to curl around a large branch. We also don’t have claws, which would be a disadvantage. I have had many online “debates” about evolution where I have to remind the other side that most “mutations” are neutral. They’re not mutations in the 1950s scifi movie sense. I have three dark moles on the front of my throat. My nephew has a cluster of about 10 moles in the same place. Whatever gene caused this did not kill us or our parents or their parents, so the trait survived. These moles have never caused either of us any distress, and I don’t think they’ve hurt our ability to find mates. If a future variant of this gene created a relative with moles all over, that could possibly be “ugly” enough to weed itself out of the gene pool due to being “different” but not disadvantaged in a survival sense. I agree with this analysis, but I think there are a couple of issues that need separating out. I’ve followed Mark’s work for quite a while, and I think part of the problem is that he is his own worst enemy when it comes to discussing his ideas. I think it’s important to separate out two things. First, the idea itself is not crazy. Perception-action systems like prehension often run close to the edge of success vs failure and even a small benefit will have functional consequences. i don’t think this is intrinsically a wrong idea. Second, though, and where your critique is spot on, is that an idea like this requires certain types of evidence, none of which are currently apparent. The recent study is interesting, but of course is not evidence for or against any evolutionary hypothesis. Mark’s problem (and this is across the board with his stuff) is that he thinks he’s solved the problem already by showing the nice internally consistent story, and he talks this way. He’s quite wrong, obviously, but frankly he’s just not that good at the data side of things and he spends too much time talking as if the problem is solved. From my perspective, as a perception-action researcher, I see an interesting idea about grip that comes with plenty of testable implications, but as yet no data that is in any way shape or form convincing. You have some interesting counter points (eg the dead hand) but I wouldn’t want to throw the baby out with the bathwater on this just yet, given there are plenty of things still to try. In the same way that Mark’s sensible idea is not evidence that it’s true, your as-yet unanswered questions don’t kill the research programme off. I have no problem with people proposing adaptive explanations for traits like this. But there are standards of evidence that need to be met before you can say anything about whether the hypothesis is plausible. At present, the data are extremely weak. Even the simplest analyses that evolutionary biologists would expect have not been done. The problem is that these authors don’t seem to know much about modern evolutionary biology, either in terms of the theory or the methods it uses. And yet, claims like this get wide attention in the press. So, yes, the idea itself is fine and could be tested, but at present there is nothing compelling about this argument. If a trait became fixed in a population, isn’t it possible that the trait would have no variation? Can’t a trait just be something everybody has? The first step is to determine the extent of variation in the trait. Certainly, there is plenty of variability in finger wrinkling in terms of pattern, depth of wrinkles, number of wrinkles, and how long it takes to occur, so these could form the basis of one analysis. Additionally, this wrinkling phenomenon is temporary and gradual, which means that we can create variation even within the same fingers on the same person. Soak them for 1 minute and do the test, soak for 2 minutes and do the test, etc., so that you generate a gradual series of increasingly wrinkled patterns. If the hypothesis is correct, then increased wrinkling should correlate with better gripping along this gradient. I know two useful standards of evidence for this sort of notion: (1) has it been demonstrated to skeptics’ satisfaction, and (2) has it been demonstrated clearly enough to merit further work? The nerve-action phenomenon, without the marble tests, suffices for (2) . Nerve-action and marbles together aren’t enough for (1). This was an interesting story for reason (2) in 2011, and it may be an interesting story for reason (1) in 2015, but it isn’t one now. I would modify (1) to state that it has passed the sorts of tests that are expected under the methods of modern evolutionary biology and it addresses assumptions it makes based on evolutionary theory. And for (2), being under nervous control has been known for decades. All they did in 2011 was look at photos on the internet and say that the wrinkles kinda look like the drainage patterns on a hill or car tire. I’ve been pondering how the nerve response can be consistent with corpses getting wrinkled fingertips. If the wrinkling is really the same phenomenon (test it by killing a dishwasher? ), it seems as if the action of the nerves must be to suppress a process normally carried out by live skin, e.g. pumping out excess absorbed water. Do corpses in water wrinkle in places live people don’t? I believe the nerve response just causes vasoconstriction — i.e., reduces blood flow to the fingers. Dead people have no blood flow. So I suspect it’s the same sort of wrinkling, and my feeling is that that’s just what skin with the properties it has at the fingertips does when it wrinkles due to lack of blood flow for physical reasons. But I am no expert on finger wrinkles — I do know something about testing evolutionary hypotheses, though. It’s not only nature that’s cleverer than I am. In many mammals, vasoconstriction reduces heat loss from extremities and is triggered by immersion. Immersion of the face seems to be key, but maybe there’s some connection? Yes, I imagine that if anything it could well be linked to vasoconstriction rather than wrinkling per se.